Dr. Seuss said it and as his March 2 birthday approaches us, it’s a useful tip to remember. For many of us, Dr. Seuss books encapsulate the childhood reading experience. We all remember learning the basics of numbers and colors with One Fish, Two Fish, Red Fish, Blue Fish. Later, we learned about the power of ordinary citizens in Yertle the Turtle. And In Oh, The Places You’ll Go, we got excited about our own potential. These are messages that stuck. And we learned them on the lap of a cherished adult as they read through the rhymes, showed us how to love words, and let the lessons of how to learn, dream and treat others sink in. As parents, we’ve likely added these gems to our kids’ libraries in the hopes that we could teach them the same lessons. How can something as simple as reading to a child be one of the most important things an adult can do? Even babies love looking at pictures and hearing the sounds of their parents’ voices. Reading to a baby is a comforting routine, a source of positive parent-child interaction, and a stimulating way help her explore her world. A study in Child Development stated that toddlers who were read to regularly at an early age displayed better language comprehension, larger and more expressive vocabularies, and higher cognitive scores by age 2. What’s more, the families in the study were all classified as low-income, suggesting that reading was an equalizer for school readiness across socio-economic categories. The long-term effects are just as stunning. 15-year-olds who were read to often as young children score significantly higher on the PISA 2009 test than children whose parents did not read to them often or at all (Programme for International Student Assessment). Nebraska: We still have a way to go. 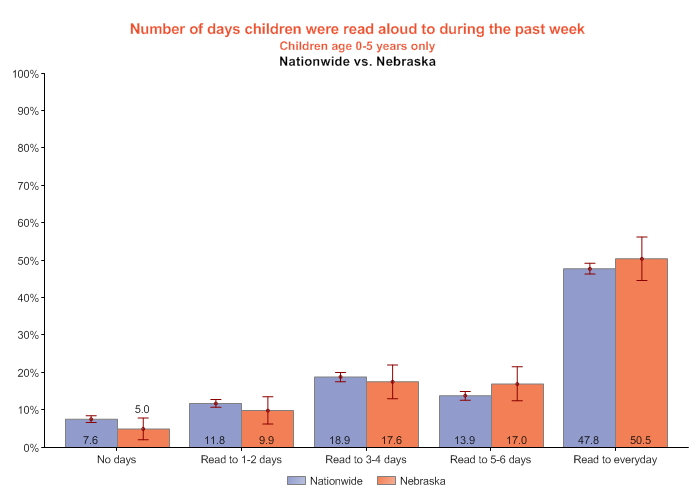 According to the Forum on Child and Family Statistics, only half of Nebraska families are reading to their children every day. This lack of regular reading aloud can have dramatic impacts on the future learning of these children. Friday, March 1 is Reading Across America Day. Saturday, March 2 is Dr. Seuss’s birthday and National Read to a Child Day. Use this weekend to galvanize your commitment to read 30 minutes a day to the children in your life. It’s a fantastic way to share special time every day, and the results all but guarantee a better school experience and more successful outcomes in life. Take a cue from Dr. Seuss – pick up a book, pick up a kid, and get reading.